It sounds like you have what is called "ink bleeding" into the surrounding tissue. No two tattoos are alike and depths of ink and types of ink do vary. This type of problem can be treated with an experienced practitioner but we advise waiting longer between treatments. Also without knowing colors of ink and settings, wavelengths it is difficult to tell. We are having very good results with Cutera enlighten as it has PICO wavelength in two settings plus PICO Genesis which can be used when a much faded tattoo is treated. Give it time, continue to massage the area (your body continues to pull a little ink for a long time after treatment). I've had 33 treatments. The laser isn't working, what else can I try? I've had 33 treatments over 5 years on my tattoo at a very good laser center. I know they're using the best lasers for the job. It's faded, but it just won't go away. I'm so frustrated. Is there anything I can try besides the traditional approach? Why do I still have bumps 5 weeks after my first laser tattoo removal session? I got my first removal session just over 5 weeks ago. I have black and red ink. There are bumps ranging from small to sort of large clusters (seems swelled) in the red part of the tattoo. It's not painful, just slightly tender and gets itchy. Ideas? How long does the ink stay in the body? After the treatment, how long does the ink stay in the body before the blood cells carry it away?I would like to move forward with tattoo removal treatments, but I am planning to get pregnant in September, when do I stop the treatments to be safe? My small wrist tattoo has been treated 8 times, is the ink too deep to be removed? I've had my small wrist tattoo treated 8 times, but the outline is still present (grey looking). I know extremities take longer, but could it be impossible to remove the tattoo considering the depth/placement? I developed 3 enormous blisters after having the Picosure laser tattoo removal procedure. Is this normal? I have developed 3 enormous blisters after having the Picosure procedure, and I'm growing more concerned now that my ankle is swelling. It's 3x bigger. It doesn't make any sense, especially since it was my calf that was treated and not my ankle. Is this normal? I have no pain. 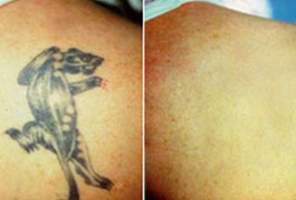 Is swelling a common side effect of laser tattoo removal? I had my first session a couple days ago, and the treatment area is super swollen and painful. Is this normal? What can I do to take away the swelling? How many sessions will be needed before my tattoo is removed? What factors influence how long it will take? I had my 3 laser tattoo removal session before 2, 5 weeks, but unlike previous times, it hasn't been healed yet and it looks like a brown smudge. My doctor said that the laser had to go deeper this time so the burning was deeper. I'm scared, is it normal? How long does it take to see results from laser tattoo removal? I've had two laser removal sessions, and the tattoo is a bit lighter, but how many more sessions will I need for the tattoo to disappear? How long should I stay out of the sun after a tattoo removal session? Can very densily pigmented black tattoos be completely removed? I understand that black tattoos are the easiest to remove because they absorb the entire spectrum of light that the Laser outputs, but I was wondering, can very dark (heavily pigmented tribal tattoos) be completely removed from lower legs? I realize it will obviously take more sessions, but how many? Are there any supplements to increase the effectiveness of tattoo removal? Will drinking water, vitamin supplements, no alcohol, etc.. help with the removal process? What is the best type of laser to use for laser tattoo removal? Are certain medical lasers better than others? What should I ask my specialist about the laser(s) their facility uses? What happens to the ink during laser tattoo removal? How does the laser remove the ink from skin? Is it sucked out of the skin or pushed deeper, so that you can't see it from the surface? Does it burn it off? Thanks! Can you drink alcohol the after you have your tattoo removed? How soon after a tattoo is placed can I start laser tattoo removal? Do I need to wait a certain amount of time before removing it? I got the tattoo about 3 months ago, big mistake, also, will it take more sessions to remove because it is new? Laser removal turned eyebrows red. I just had my first laser treatment today on my brown eyebrows. The ink has turned red. Is this going to be permanent or will it fade? How does tattoo removal look on African American skin? What type of scar is left on African American skin after either regular or laser tattoo removal? Does the type of laser affect laser tattoo removal effectiveness? I have had 2 treatments with a laser (candelesend) I do not know if this is the right spelling. I have some fading, but minimal at most. The laser is not doing much in the area of removal. What do you have for information on lasers that work? Will laser tattoo removal get rid of hair near the tattoo? Hi I have a tattoo at the base of my skull; I got it when my head was shaved. You can see half of it on my neck (below hairline) and half in hair, I'd like to get it removed but I don't want a permanent bald spot. Will Laser TR get rid of the hair?